Make Money on the Internet By Promoting One of the Hottest Seduction and "Inner Game" Products Online, And Get Cutting Edge Marketing Tools To Help Your Online Business Succeed! Do you have a website, an e-zine, a blog or online newsletter? Would your clients, subscribers or web site visitors be interested in learning how to rid themselves of approach anxiety, flirt with women and transform themselves into natural pick-up artists? Or, are you an online marketer thinking of starting a website or a pay per click campaign, but you need a high quality product to promote? Are you tired of being pitched to endorse tons of junk products online that you would be embarrassed to present to the people who trust your opinion?Are you sick of all the fads and gimmicks being sold on the web in the seduction marketplace and you want something legit to promote? Do you sincerely want to help improve other people's lives while earning an automatic pilot stream of income for yourself at the same time? If you answered yes to ANY of these questions, then you can now promote one of the hottest information products online today and begin enjoying an extra stream of income when you sign up for the Radical Inner Game affiliate program. 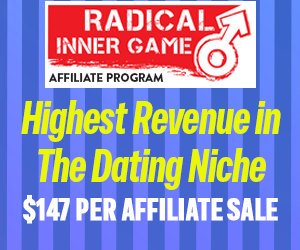 An affiliate program is a web-based referral system where you can recommend our e-book to other people, send them to our website at RadicalInnerGame.com through a specially coded affiliate link, and you get paid commissions for your referrals when someone makes a purchase. When you sign up for our affiliate program using the form below, you will not only be authorized to promote Radical Inner Game on your website, in your newsletter or even through Pay Per Click advertising such as Google, you will also have access to all of our marketing tools that will help make your online business succeed! Although we can't guarantee how much money you will earn (please read the earnings disclaimer in the affiliate agreement), we can tell you that many of our affiliates earn hundreds or even thousands of dollars every month and the income potential is virtually unlimited. One concern many people have is that they don't know how to promote or advertise an e-book on the Internet. 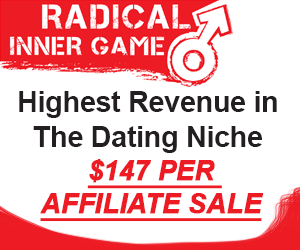 With the Radical Inner Game affiliate program, you don't have to worry about lack of internet marketing experience because we provide you with the resources you need to be successful. When you sign up for our affiliate program, you get instant access to our entire private affiliate area, which includes professionally-designed book cover graphics, banners, promotional letters, text ads, classified ads and even lessons on Internet affiliate marketing! 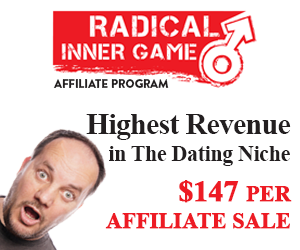 Becoming a Radical Inner Game affiliate is absolutely FREE, and you can get started instantly. We are currently selling 3 versions of our product - i.e. 3 "packages", each priced differently. So you'll be making up to $147 for each visitor you send us that purchases the Radical Inner Game Program. If you take a look at our sales page, you'll see that we are striving to sell the "Complete Package" and leave the other two options as secondary alternatives. I use professional marketing tecniques and constantly improve and tweak my sales letter to increase these conversion rates. You will find your ClickBank account credited with the money you've made, regardless of the amount - there are no minimum payments, and obviously no maximums! The book is really the long-awaited glimmer of hope that men in the seduction community have been looking for. The quality of the program is outstanding. We stand 100% by our promises and we actually over-deliver on them! Our reputation is more important to us than anything, that's why we make everything possible to ensure that we deliver outstanding quality to both our clients and our partners. Once you enroll in our partnership program, you will receive access to: endorsement letters, links, banners and other incentives that you can use in your promotions. If you want a type of incentive and we don't have it, we will create it and customize it for you to help you to be more efficient in converting prospects into customers. Keep track of your orders online 24 hours a day. Clickbank offers great reliability and a ton of useful tools to help you promote the ebook for even higher conversions. I am a real human being. If you need advice or help, if you have any questions whatsoever, you can reach me by e-mail, telephone or Instant Messaging. You have all my contact details in the affiliate starter pack. It's my interest to help you, since we're splitting the profits. This is a win-win situation - and therefore I want you to succeed in promoting my e-book!